I love to snack. All. The. Time. 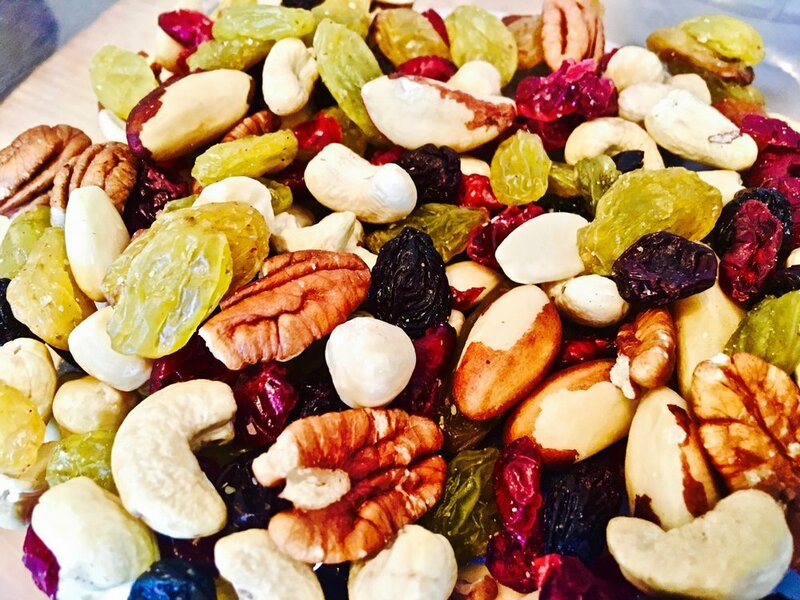 And thankfully, healthy snacking between meals keeps my metabolism fired up and my mood elevated. I’m so inspired by the way Jamie Oliver puts food together. So beautiful, tasty and easy. I’m all for ‘easy’! And I’m all for making things that I’m likely to already have in the cupboard. 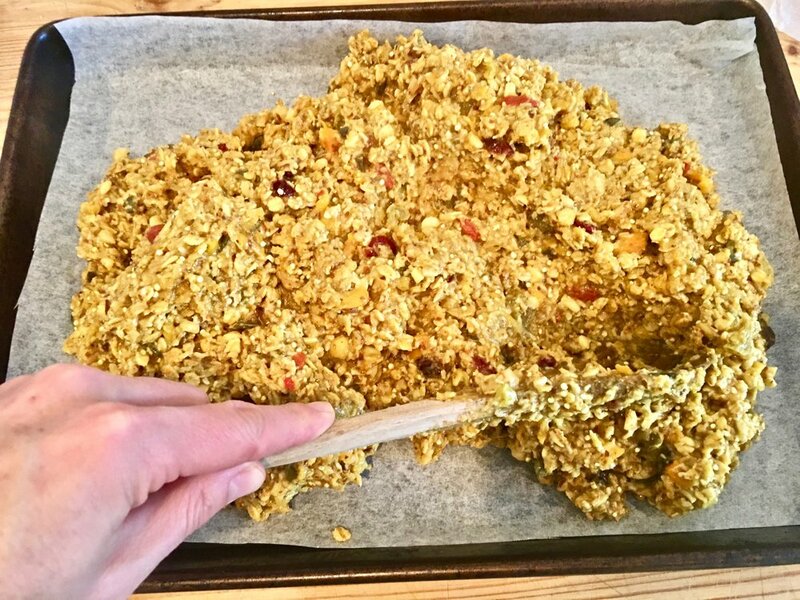 Jamie does a delicious porridge bar in his Superfood Everyday cookbook. My recipe is following Jamie’s but with my own spin on ingredients and method. 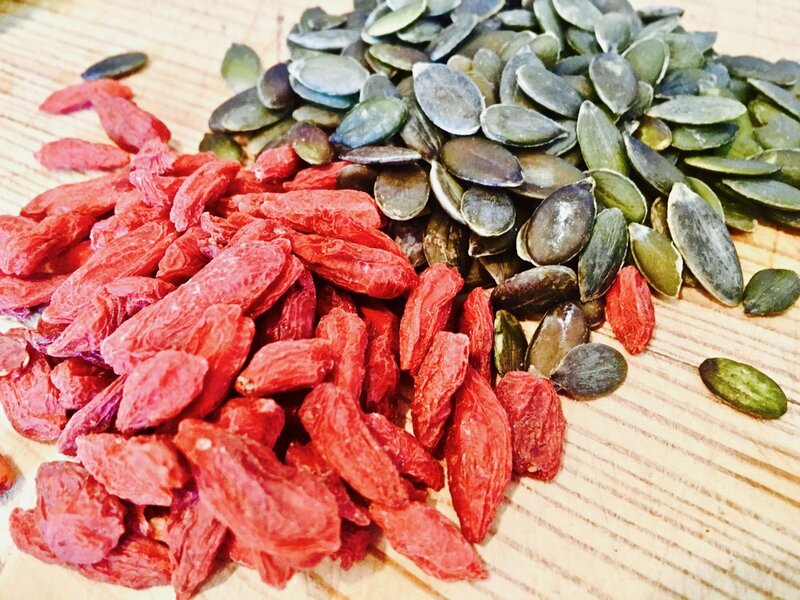 My scrummy brekkie bars are packed with protein and superfood nutrients for slow release energy. 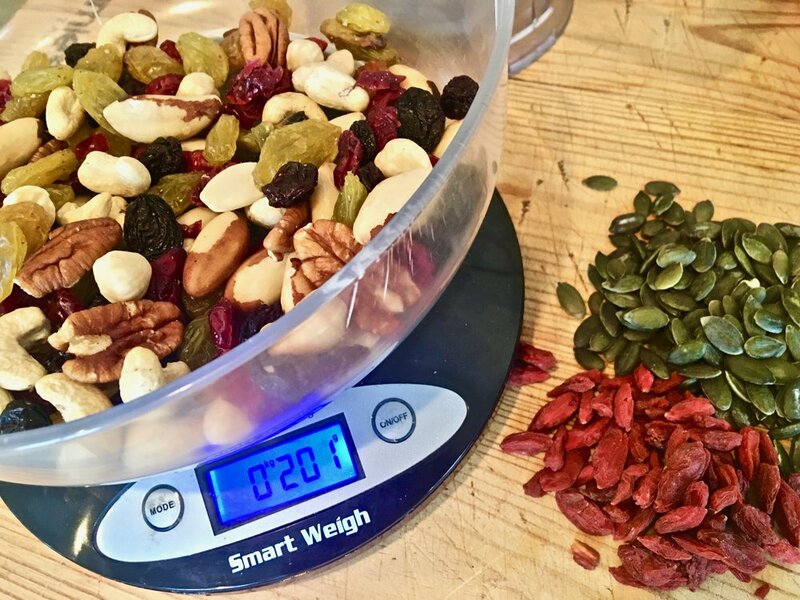 Awesome if you need something quick for yourself or the kids to munch on the go, in the car, in the stroller, on a plane, on a train.. or in bed tucked up with a cup of tea. Takes 20mins to prep. About 1 hour to bake, or until golden brown. Makes 28 bars. Halve the recipe if you want to make less or freeze some and bring them out for later. 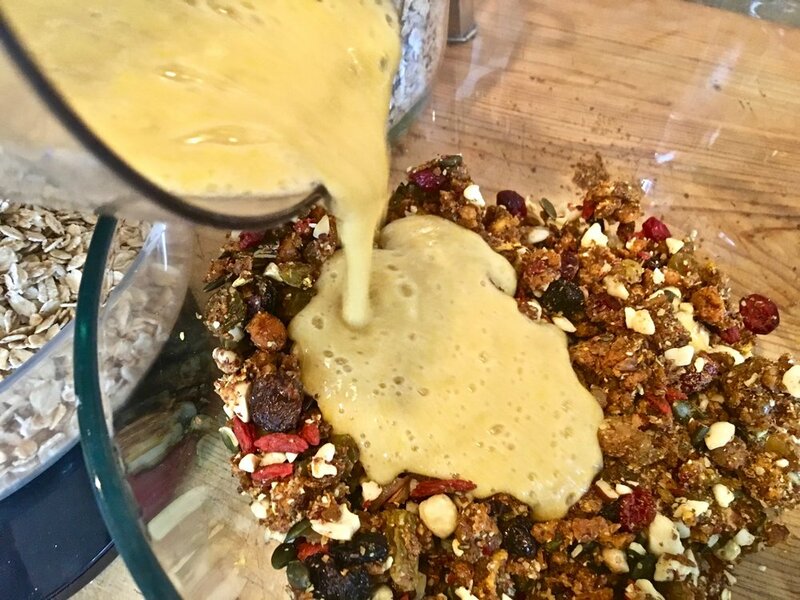 Whizz the nuts, seeds, dried fruit and orange zest from 1 orange in the blender or food processor. Put the mixture into a large bowl. Add in the quinoa and fold into the mix. 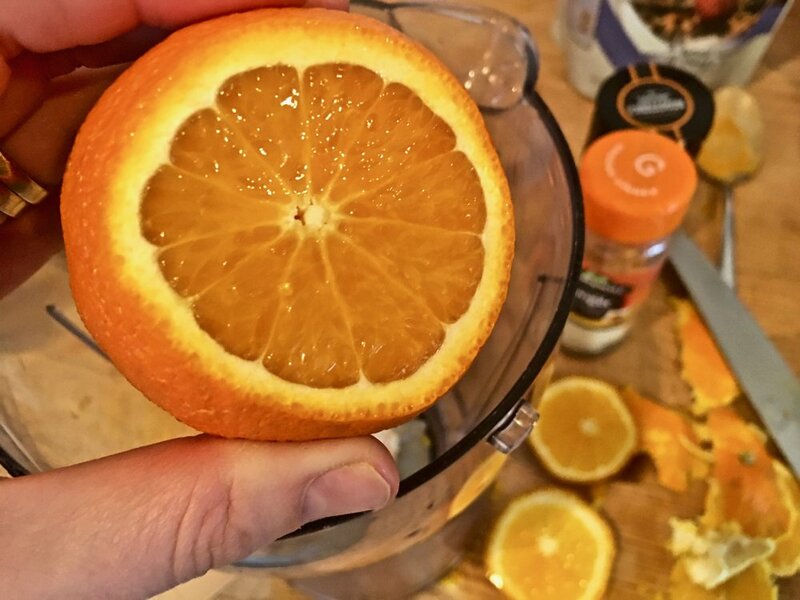 Whizz the 2 peeled orange segments and bananas in the blender. Add this and the honey to the bowl and mix. Add in half the water and stir. Pour into a wok type pan and put on a medium heat on the stove. Add the porridge oats and mix together until all the oats are covered and start to porridge-ify. Add a little more water and keep mixing for 5mins or so. Line the bottom of a baking tray (about 2 inches deep) with some baking paper. Spoon out the mixture and spread evenly edge to edge. Using a knife pre-cut the bar shapes on the surface, makes it loads easier to cut properly later. Optional: You could also honey glaze the top of the bars by literally brushing on some more Manuka honey. Place the tray in the bottom of the oven. Bake for 60mins or so, but depends on the oven, so keep an eye on itfrom 45mins onwards to ensure it doesn’t burn and it setting. Bring the tray out and let it cool for 10-15 mins before cutting and transferring to a tray to air cool. The bars might still feel a little soft in the middle, as they cool they will set a bit more. Enjoy cold or warmed through for brekkie or a snack with some yogurt and grated apple. I can’t seem to stop at one though. Doh! YUM!